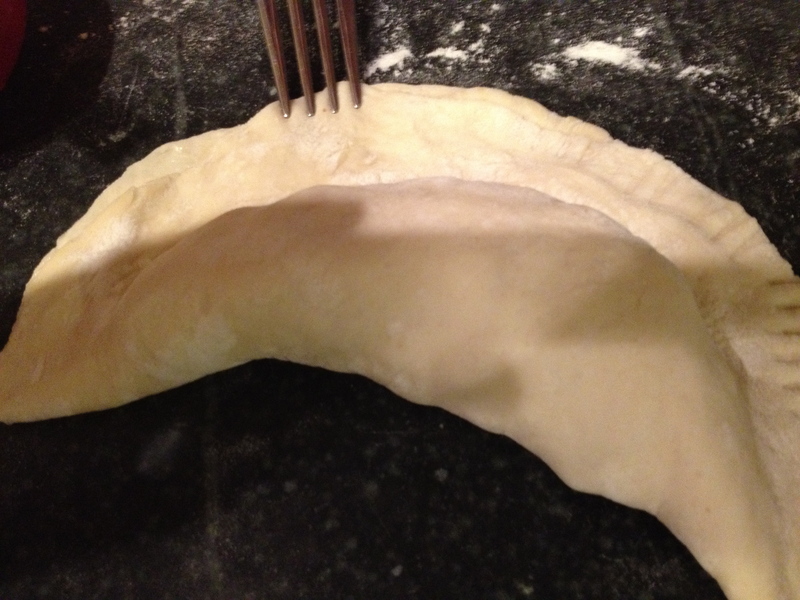 Recipe: Calzoni e Panzerotti. . . Yum-Yum!!! This past Monday, after 4 weeks of winter break, my youngest son, Mattia, went back to school. I already miss him! To ensure that he would not forget his mom, I went on a three-day cooking marathon: Baked rigatoni with tomatoes/béchamel sauce on Friday, baked Calzoni and fried Panzerotti on Saturday and Tagliatelle alla Bolognese on Sunday! Oh. . . he will remember me! Even if you are not trying to impress your son, you can still treat yourself to this bontà (delicacy). 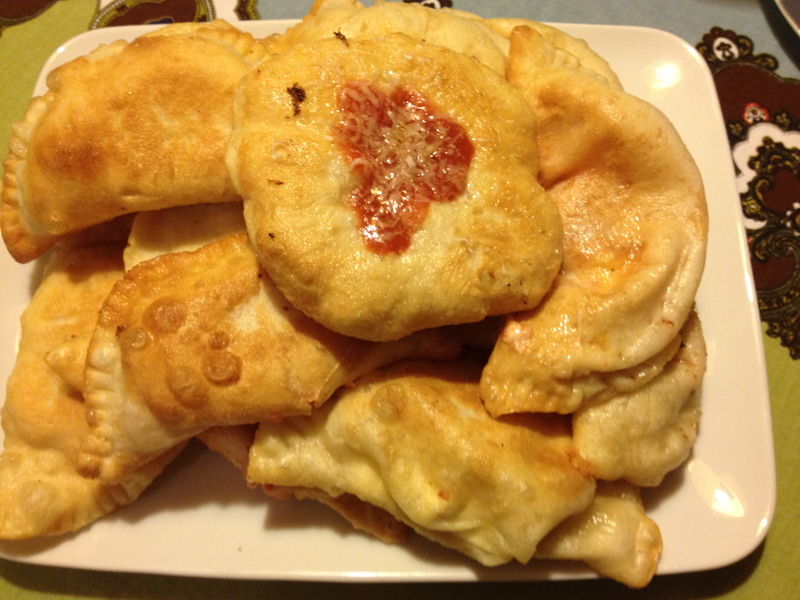 I will share with you the recipes of the calzoni and panzerotti. The Calzone al forno (baked calzone) is a specialty of the Neapolitan cuisine, yet widespread through Central, and Southern Italy. 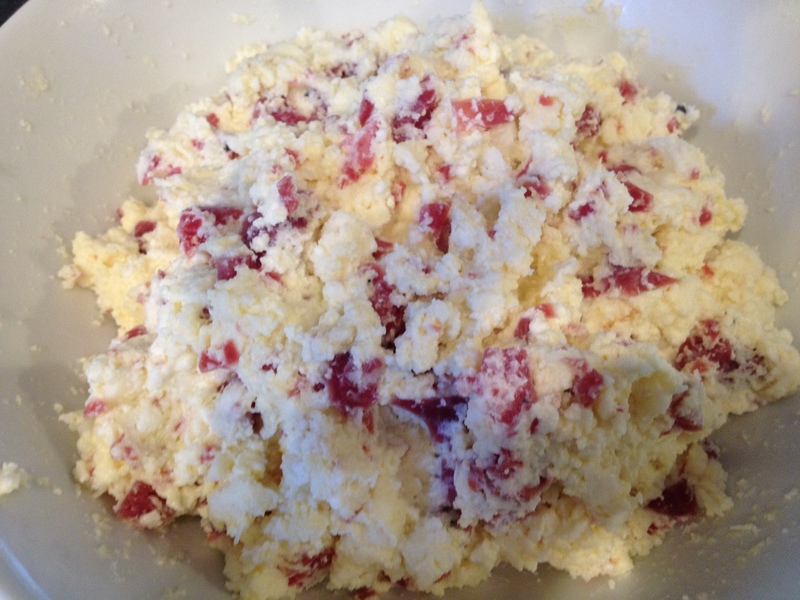 The dough is the same as the pizza and the filling is traditionally composed of mozzarella or provola, grated cheese, ricotta and salame. In Naples, you can taste delightful calzoni in every Pizzeria, where they are baked in traditional forni a legna (wood fire ovens). 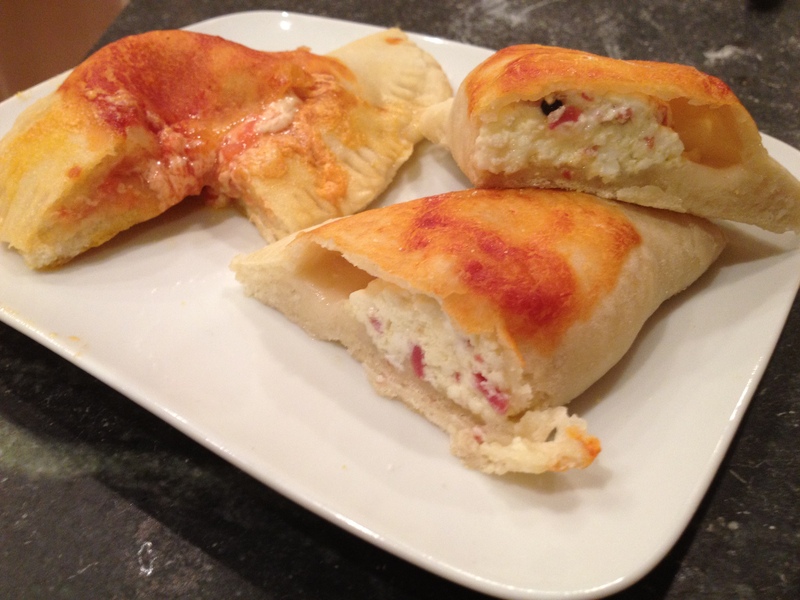 The Panzerotto, typical of the Italian region of Puglia, is simply a variation of the calzone. 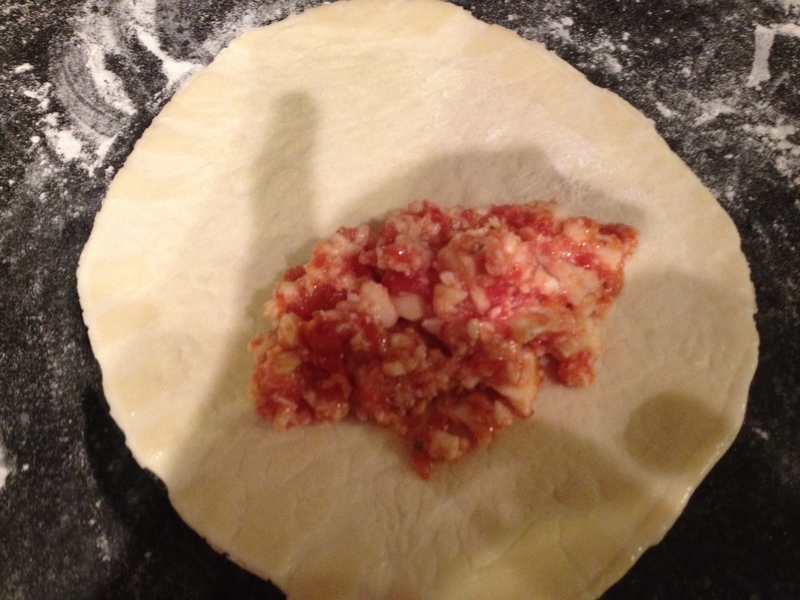 The same pizza dough is used; however, the traditional filling is a mix of tomatoes and mozzarella. 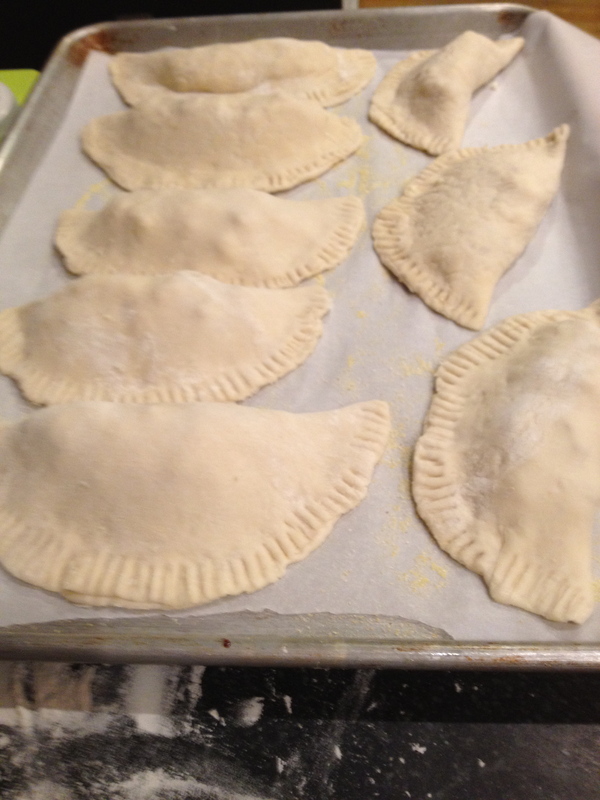 The Panzerotto can be baked or fried. Although, a specialty of Puglia, the panzerotti, just like the calzoni, are found everywhere in Italy, and particularly in the Southern regions. 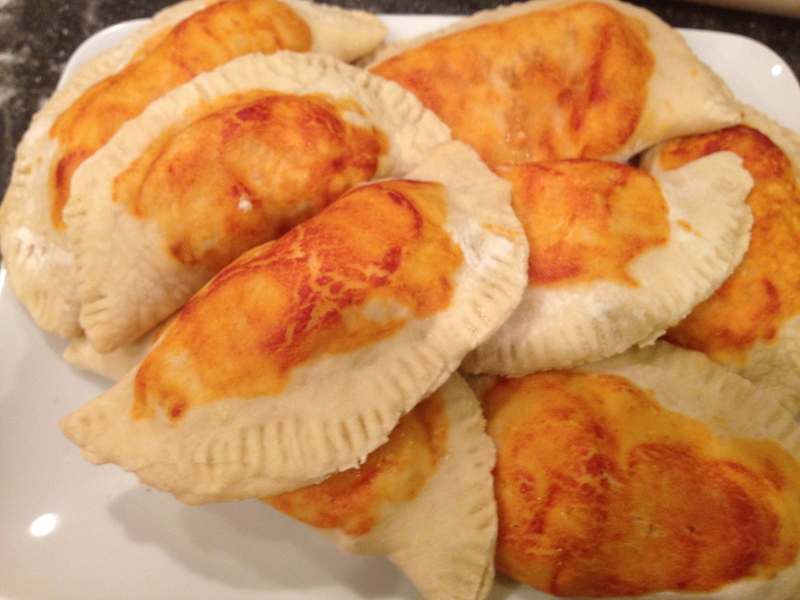 The panzerotto is sometime also called calzone fritto (fried calzone). 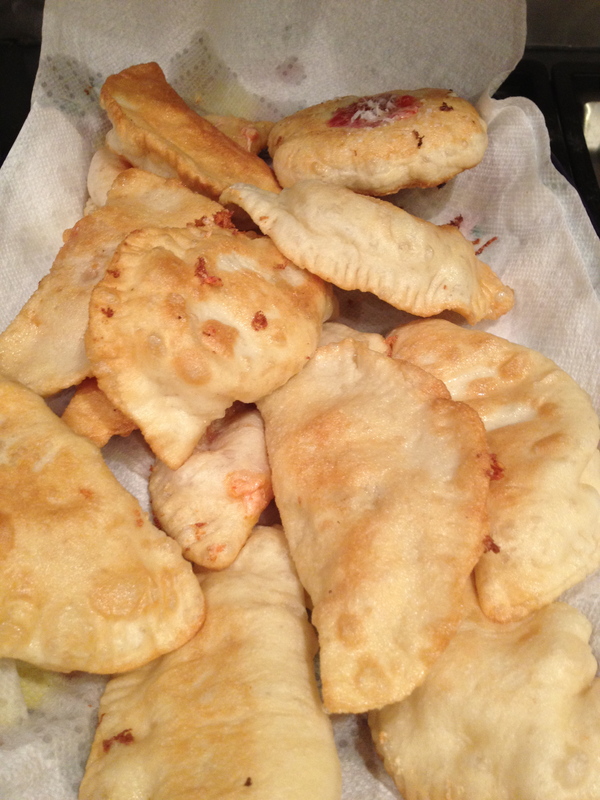 Fried panzerotti were one of my favorite treats during my college’s years in Napoli. Friggitorie (local shop selling fried food) selling hot panzerotti, crocchè di papate (potatoes croquettes) and pastacresciuta (fried dough) are still in many corner of Naples; My favorite friggitoria was the Friggitoria Vomero, outside the stop of the Funicolare Centrale (funicular railway). The recipes below are the typical version of calzoni and panzerotti however, you can create your own filling, based on your own likes. Get creative! Dissolve the yeast in a 1/4 cup of water with ¼ teaspoon of sugar. 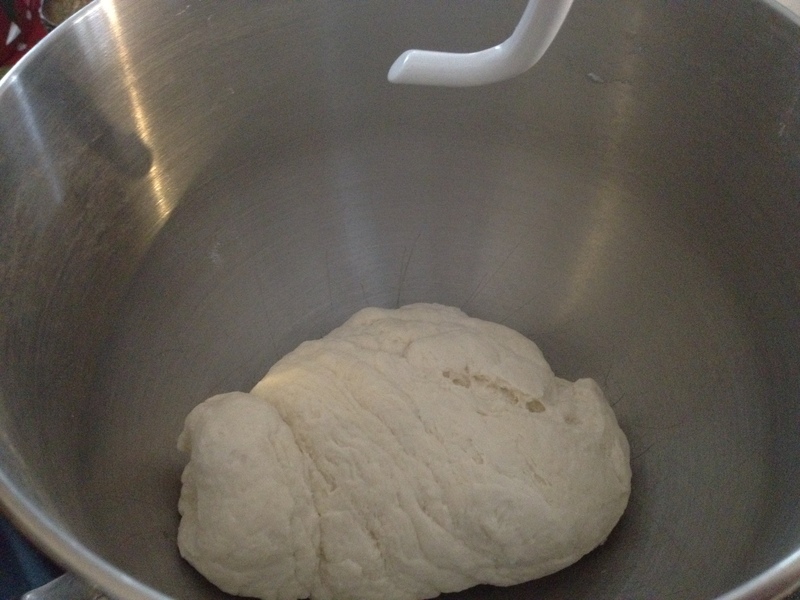 Let the yeast foam (5-10 minutes). In a separate small bowl dissolve the sea salt into a 1/4 cup of water and set aside. 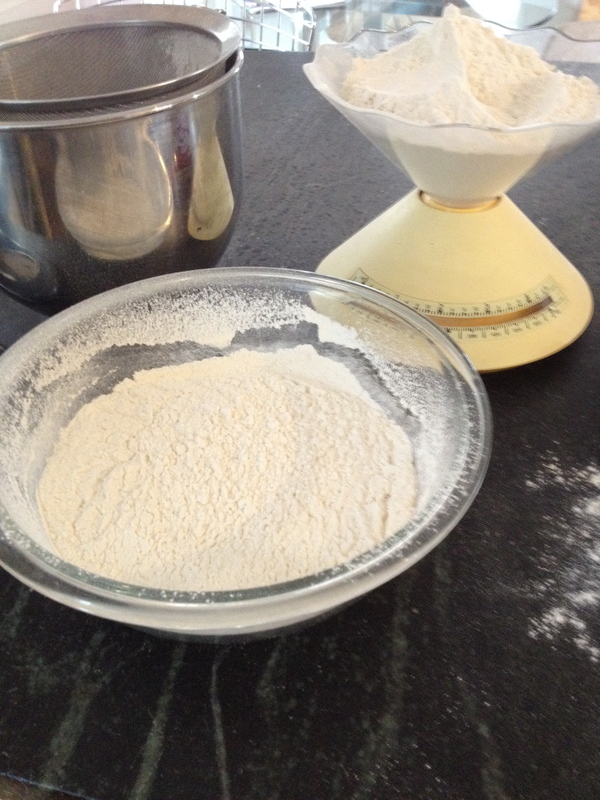 Sift the two types of flour and transfer into the bowl of a standing mixer with the hook attachment. Add the yeast and start mixing at low-speed. 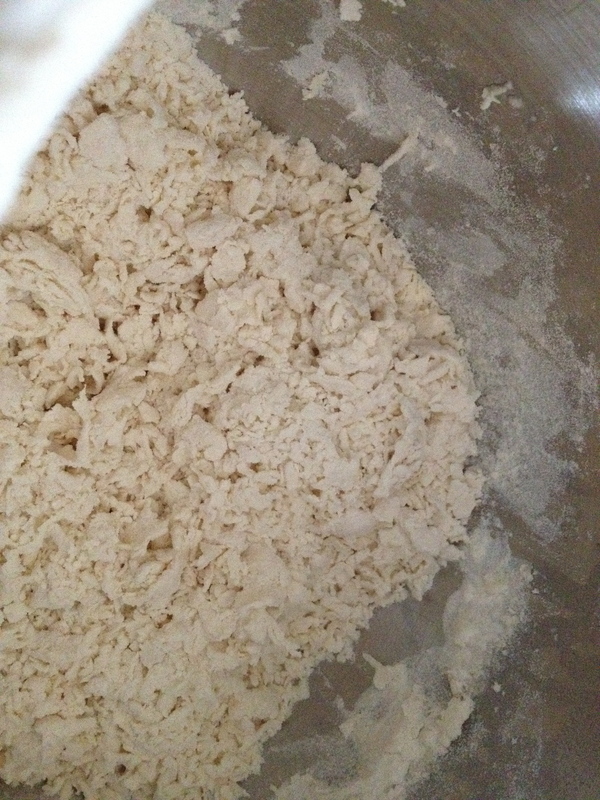 Once the yeast has blended into the flour, increase the speed and slowly start adding the water. Once you have added approximately 3/4 cups of water, you can add the salted water. 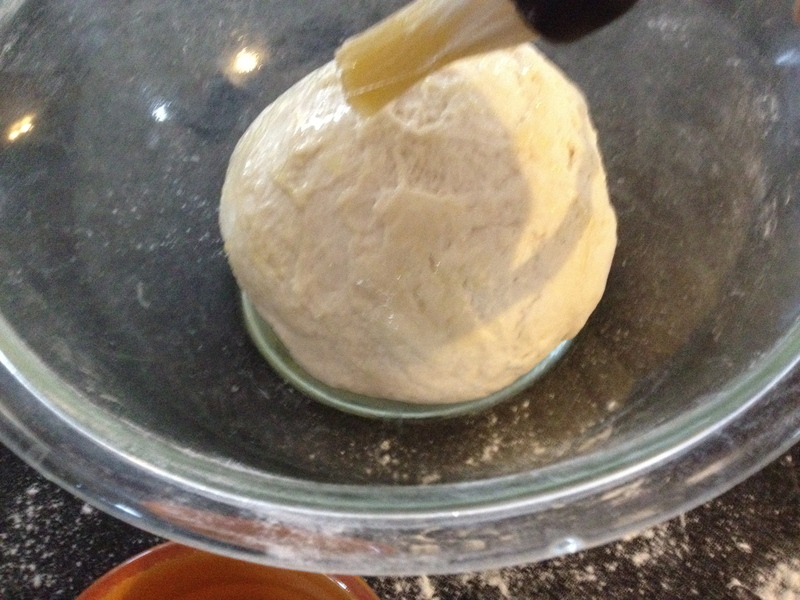 If it appears that the dough is still not coming together, add the remaining ¼ cup of water. 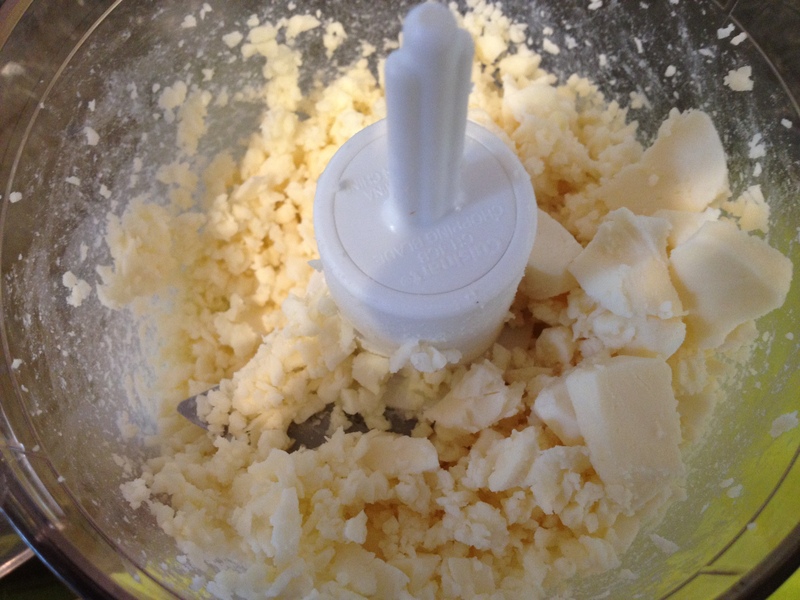 Continue to mix until the dough forms a ball and the sides of the bowl are completely clean. 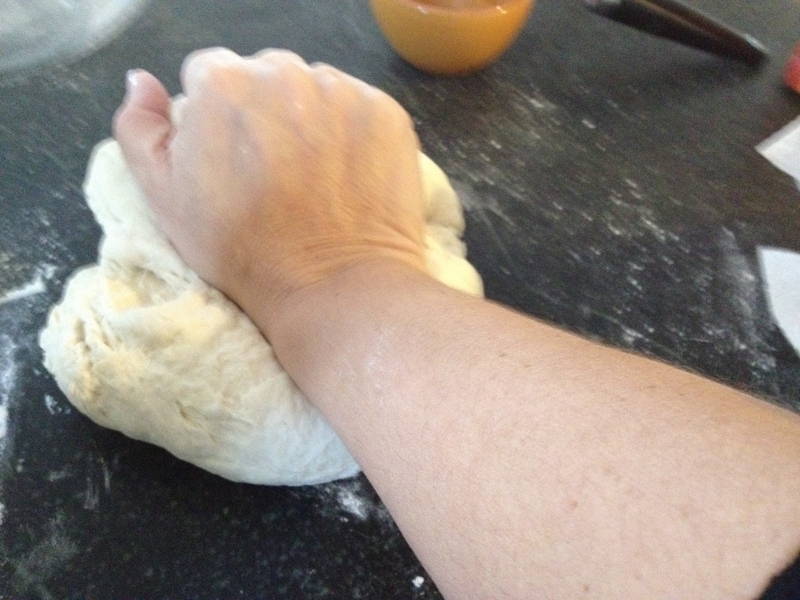 Transfer the dough on a slightly floured surface and knead for 1-2 minutes until smooth. 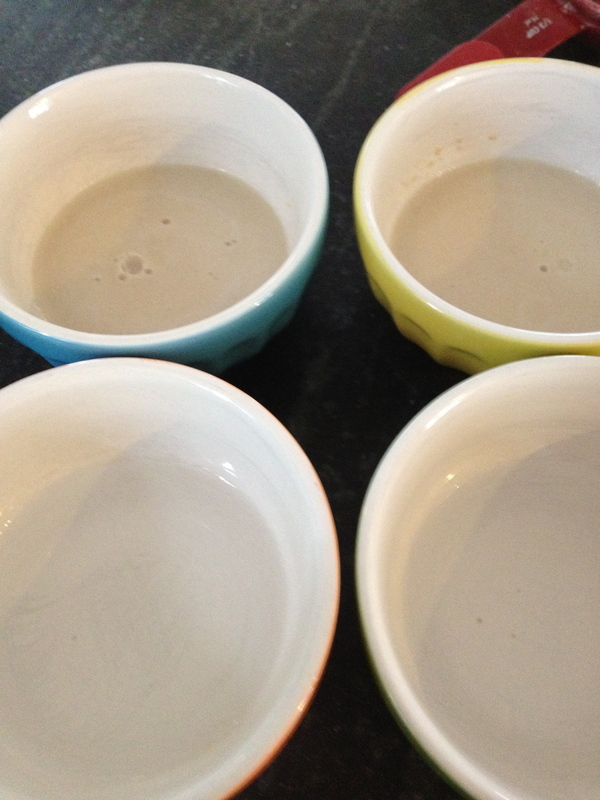 Form a ball and transfer to a bowl that you had previously brushed with a little bit of oil. 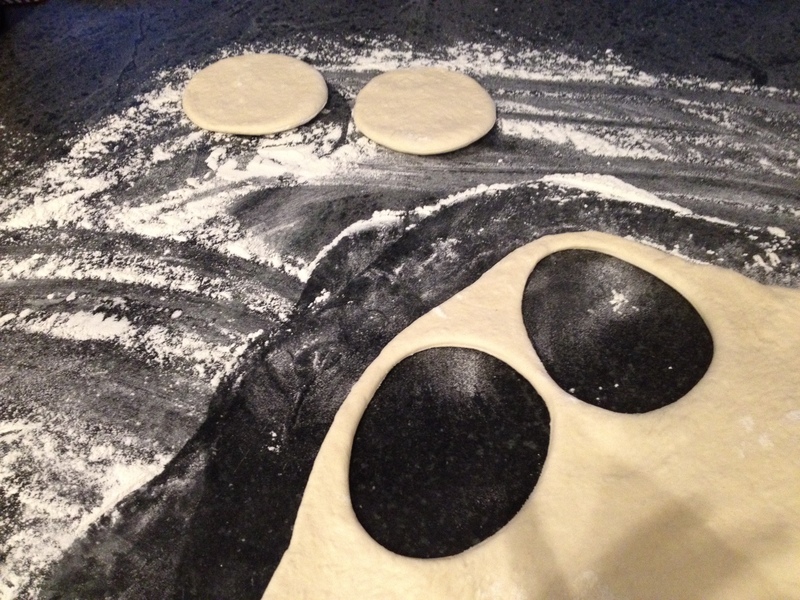 Brush also the dough with oil to prevent it from drying, and cover with plastic film and with a kitchen towel. Keep the bowl in a dry place and let raise for 2 hours (during winter, sometime I keep the dough in the oven with the lights on, the warmth of the lights helps the raising process). You can now start to assemble your filling. 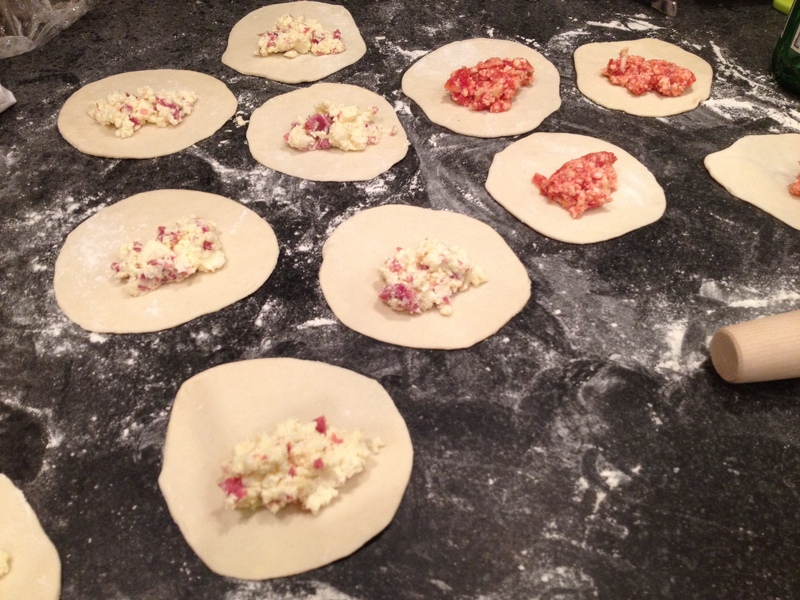 I personally like to use both types of ripieno (filling) for both the calzoni and the panzerotti. I then bake, and fry some of each. 2-3 cups Extra Virgin Olive Oil or Peanut Oil (Peanut oil has a high smoke point and neutral taste which makes it perfect for frying foods. Extra virgin olive oil also has a high smoke point however, you will definitely taste its flavor). 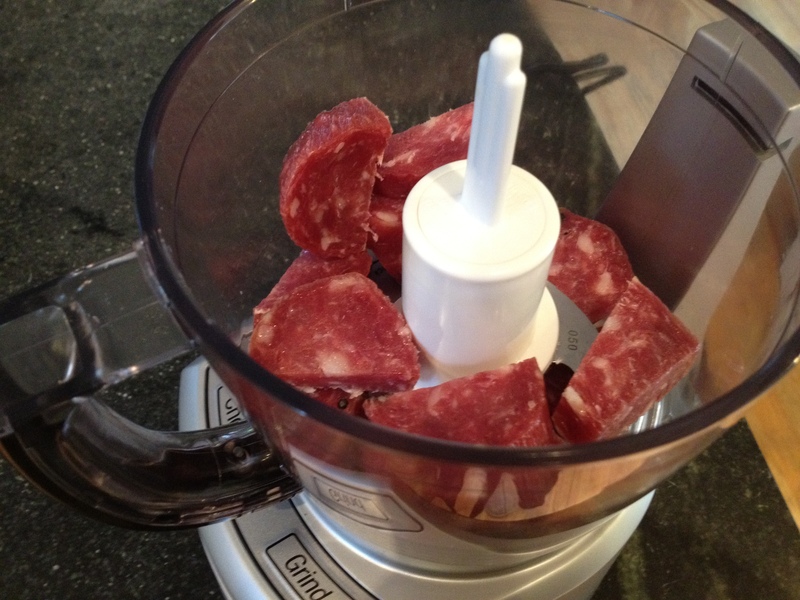 Chop the mozzarella and the salame into pieces (I use a food processor. Using the pulse option I easily obtain small pieces). 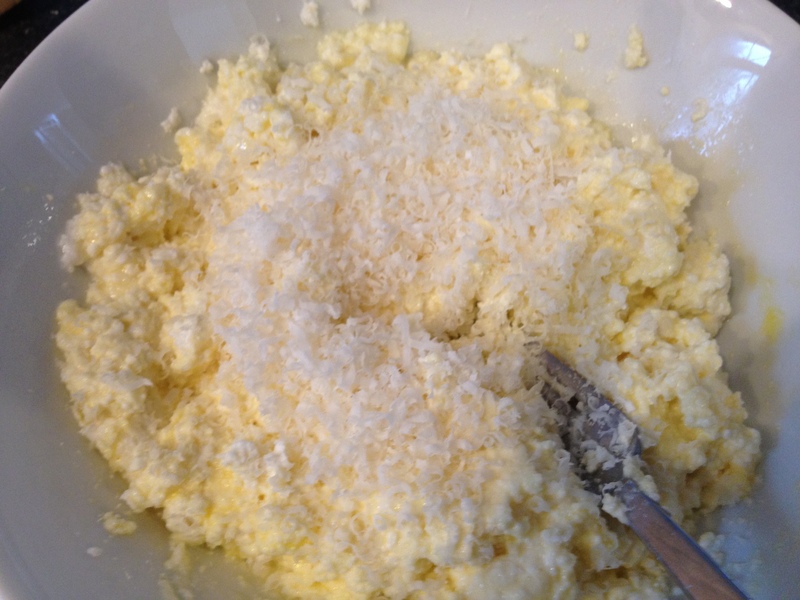 In a bowl combine the ricotta with the egg, the Parmigiano, the pecorino, salt and pepper. 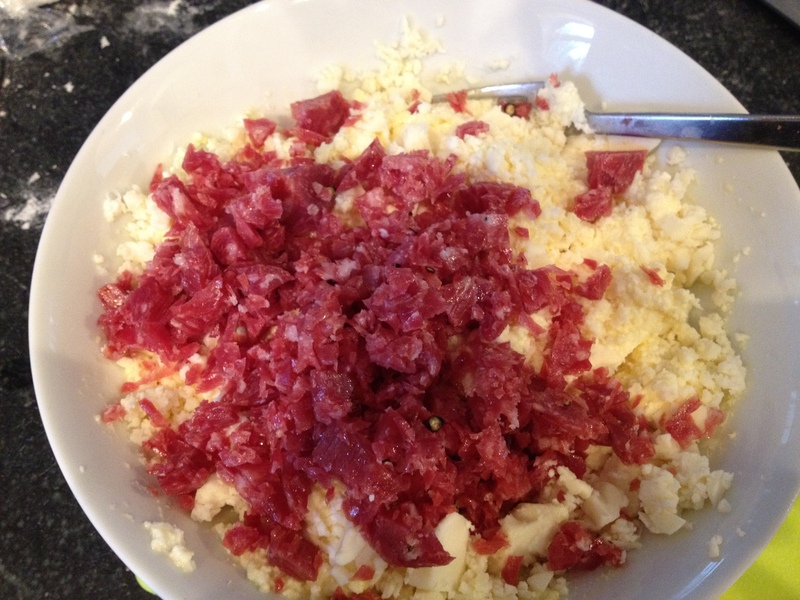 Add the mozzarella and the salame and mix well to combine. 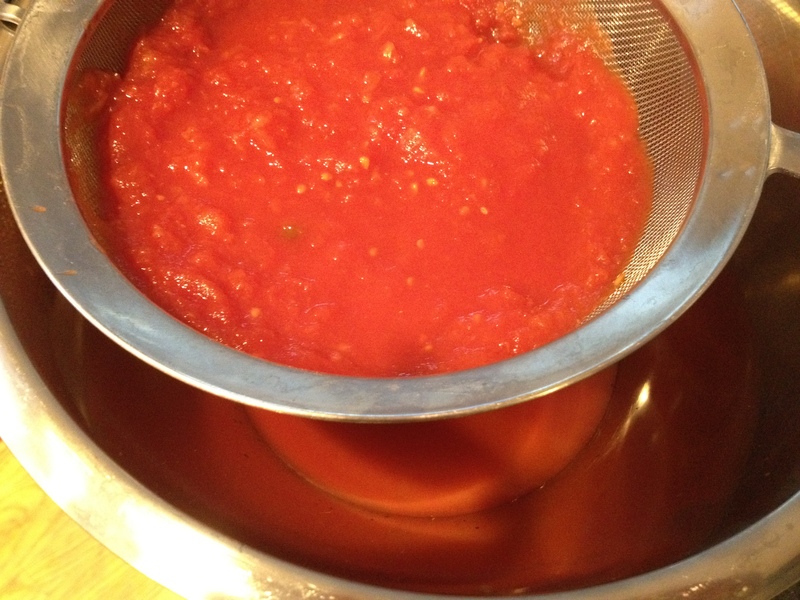 Pour the chopped pomodori (tomatoes) into a strainer sitting over a bowl and let drain the water until ready to use. When you are ready to stuff the calzone and panzerotti, transfer the tomatoes into a dry bowl, add the mozzarella, the oil, the salt and, the oregano and mix together. 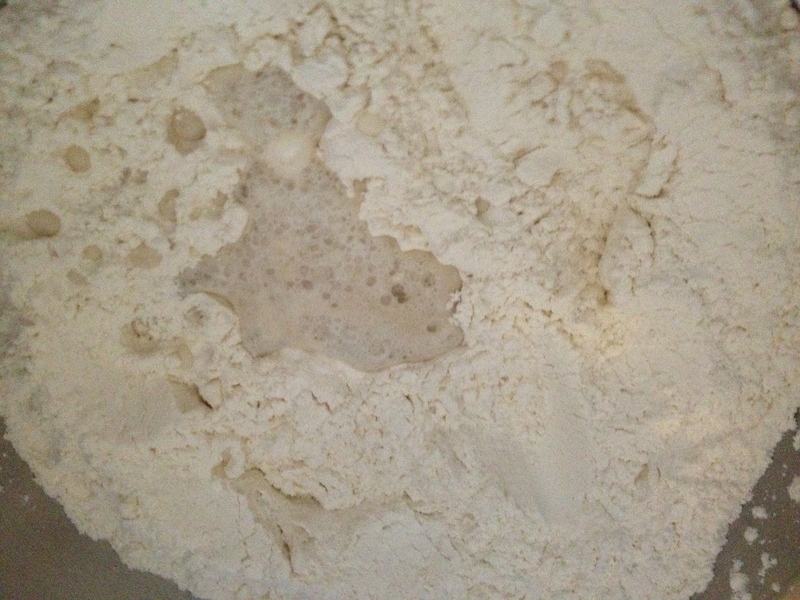 Transfer the dough on a surface dusted with flour and knead for 1 minute. Roll out the dough, and with a cookie cutter or a glass, form 5 inches diameter disks; Placed the disks on a floured surface. 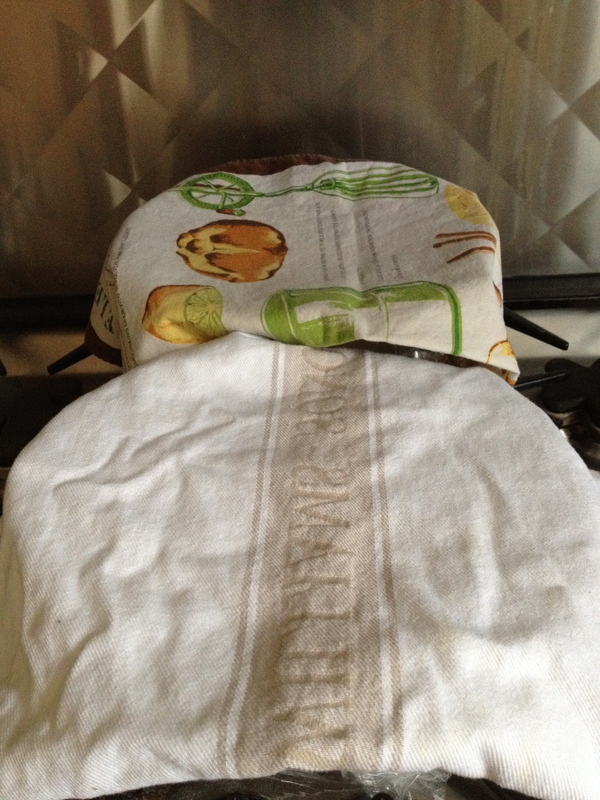 Cover with plastic film and a kitchen towel and let rest for 15 minutes. Preheat oven at 450 degree. Line a baking sheet with parchment paper and sprinkle with corn meal. 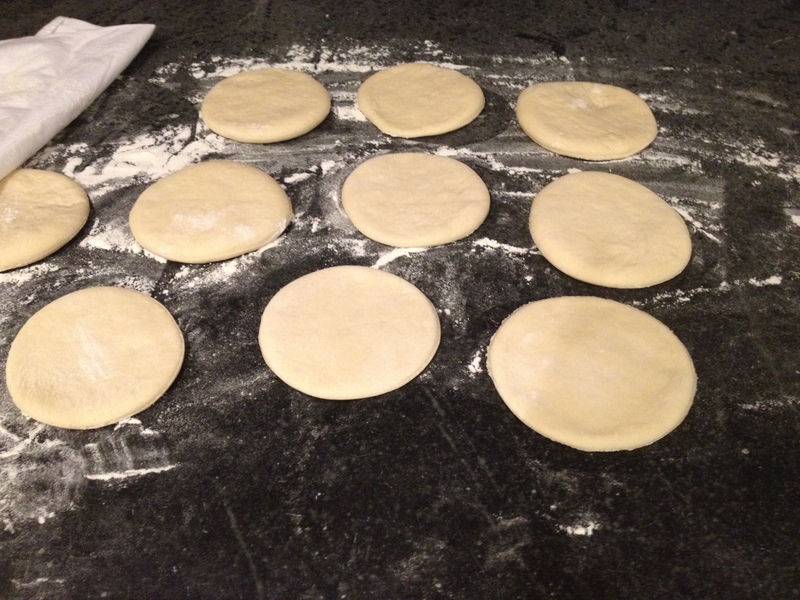 With your hand and the aid of a rolling-pin, roll out each disk until very thin (less than ¼ inch thick). Put some of the filling in the center of each disk. Brush the edge of each disk with water and close each one by folding the dough over and pressing down along the edges with your finger first and then with the tines of a fork. 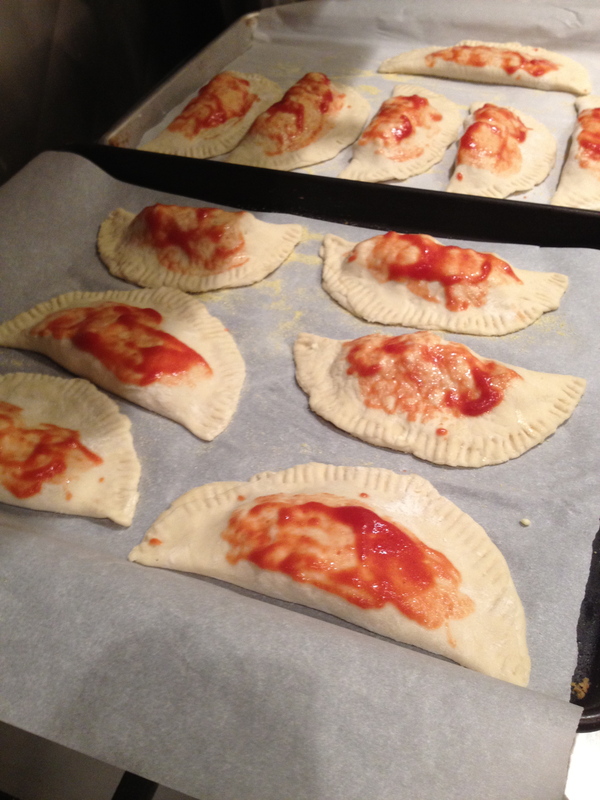 Place half of the calzoni and panzerotti in the baking sheet and brush the top with tomato puree. Bake for 10-15 minutes. Let rest for 5 minutes then enjoy! 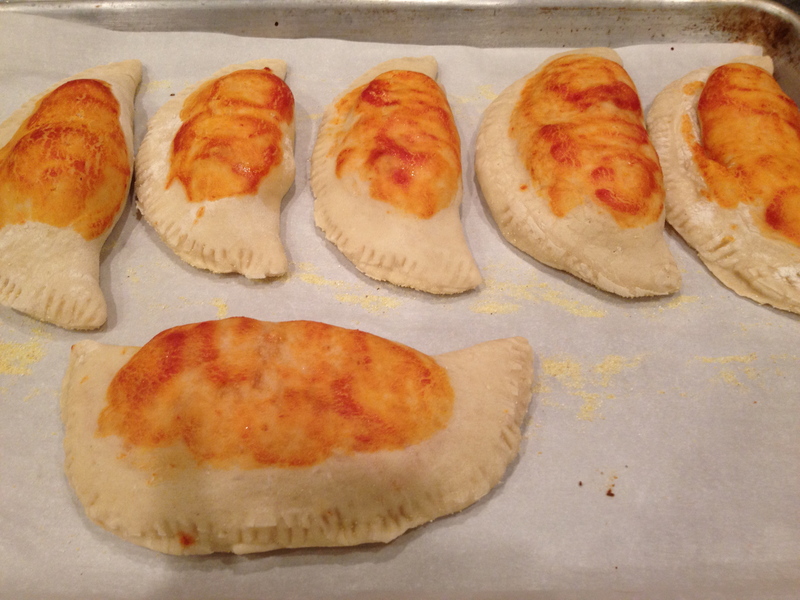 The other batch of canzoni and panzerotti will be fried. In a large pan, heat 2-3 inches of olive oil or peanut oil to 170 degree. If you don’t have a thermometer you can drop a piece of bread without crust into the oil, if the bread reach the bottom of the pan and quickly return to surface, the oil is ready. 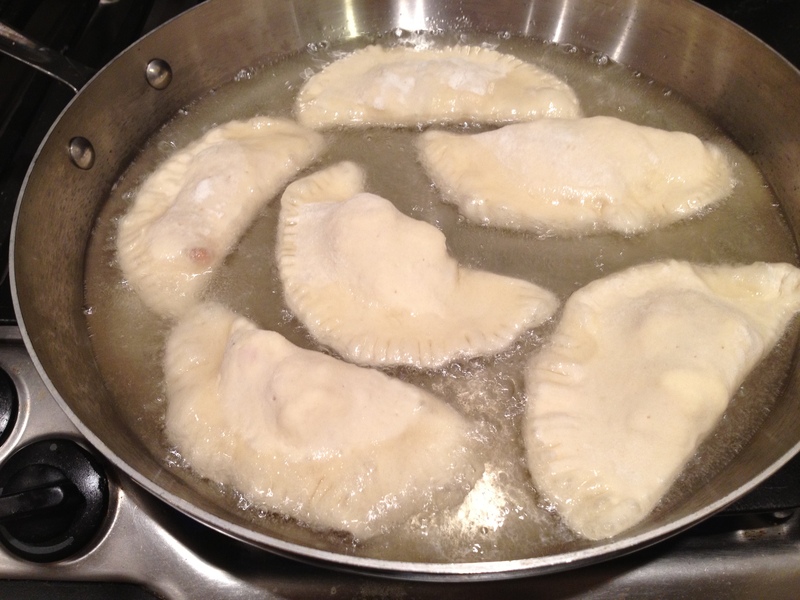 When the oil is ready, fry the panzerotti and calzoni, few at the time, turning them on both sides until golden. 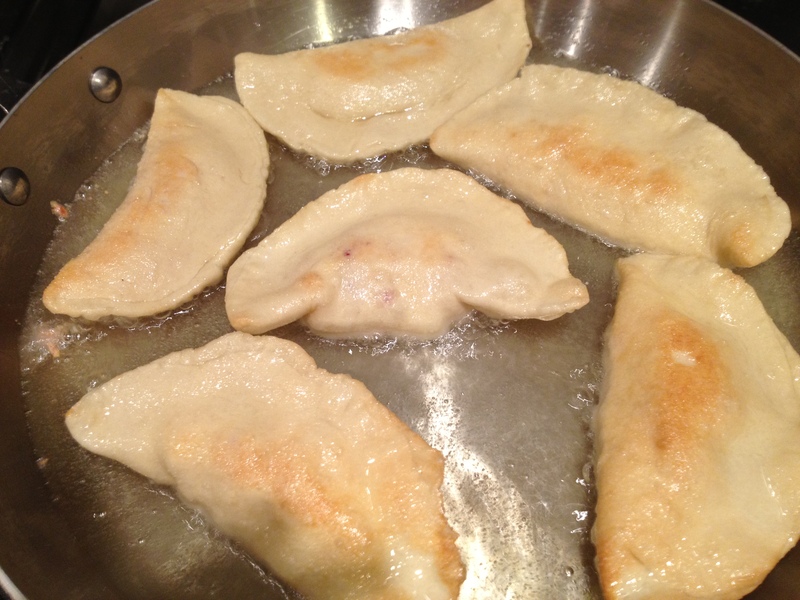 Remove them with a slotted spoon, drain on paper towels, and serve hot. 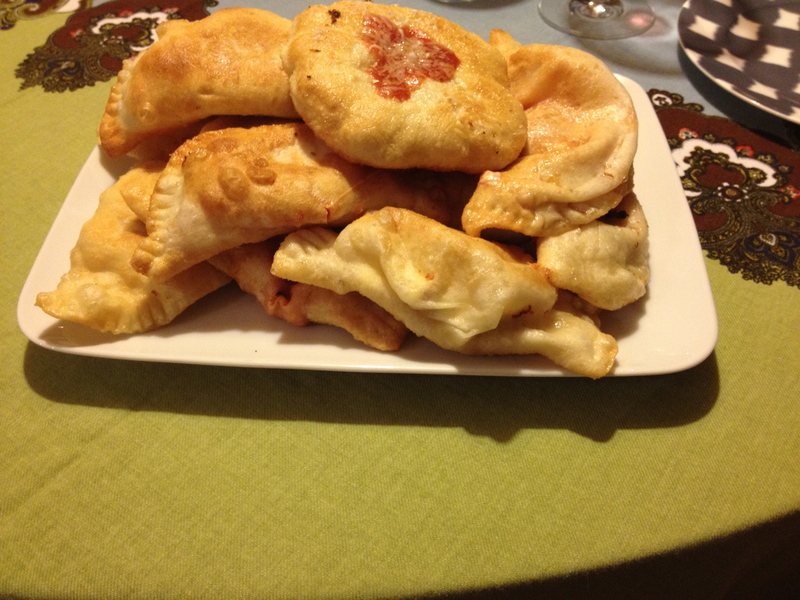 Sitting on top of the fried calzoni and panzerotti is something that my mom used to make. It’s the pizzetta fritta (fried little piazza), simply a thicker disk of dough with a slight well in the center. First you fry the side with the well then, flip over, and while it is frying, fill the well with a spoonful of tomatoes purée and a sprinkle of Parmigiano cheese. I loved it then, and I love it now! I hope you will enjoy these recipes. Let me know how creative you will be with your fillings! You have helped me find an answer to a question I’ve often wondered my whole life. The word Panzerotti. In my family that word, panzerotti, is used for potato croquettes. Growing up in New York I’ve asked other Italian Americans and they have never heard of that word used for potato croquettes. I always thought it was a regional word difference. I’m 2nd generation American on one side of the family and 3rd generation American on the other. The closer side is Sicilian the other is descended from Naples. Through the years by not keeping up with speaking Italian or having any family connection to Italy the family lost what the immigrants knew first hand but didn’t pass it, ALL, on to us. I just happened to open your website while looking for a potato croquette recipe and there is was. Panzerotti! I was not even looking for it but I recognized the word when I read it and said it out loud. Thanks again. Your recipes look delicious too. Your directions and pictures make it so crystal clear. 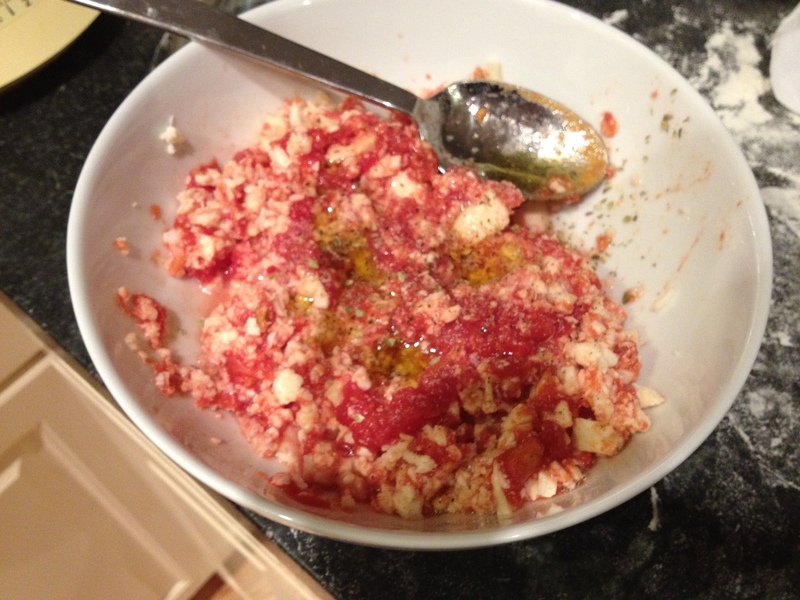 Thank you…Let me know if you will try the recipe! Happy New Year!!! What an absolutely lovely (and mouthwatering!) post! Thank you…looks like is my most viewed post! Yum! I’ll be trying this out. I’m serving osso bucco for a dinner party and am wondering what is traditionally served with it. Pasta? potatoes? rice? Also, any suggestions for dessert (not too time consuming!) would be welcome! Ossobuco is traditionally served with Risotto alla Milanese (saffron risotto) however, Polenta could be a nice option. For dessert I would serve a simple Panna Cotta served with Berries Sauce. Enjoy your party…and the cooking!